Dinokeng Game Reserve has decided to use extreme measures to fight Rhino poaching and it seems to be working well. According to the wild game reserve this new technique involves poisoning the rhino horns so that people get ill if they consume them in any way. The Game Reserve injects a mixture of parasiticides and indelible pink dye into the Rhino’s horn to make them useless to rhino poachers. The dye is usually used to colour banknotes and it makes the rhino horn easily identifiable even if it has been crushed into powder. During the ‘toxification’ process, the rhino gets tranquillised and a hole is drilled into its horn. The dye and parasiticides are then injected into the Rhino horn. The poison is actually used to control pests like ticks on animals such as horses and cattle and is lethal to humans. Those who do consume it will have stomach ache, diarrhoea and suffer from nausea. The process was established by Dr Charles van Niekerk, a veterinarian and the landowner of Dinokeng Game Reserve. A microchip will also be planted in the horns so the game reserve can keep track of the Rhinos, or at least where their horn, at all times. Sabi Sand Game Reserve, has also injected the mixture into their rhino’s horns and in the past 18 months over 100 rhinos have been injected with the poison as well as the dye. 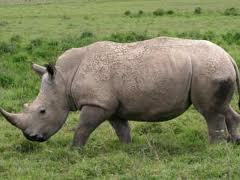 The programme is extremely effective and none of the marked rhinos have been poached at all, but it is very expensive. The government is already searching for sponsors to help the plight of the rhino and the reserve plans to increase its area by another 40 thousand hectares in the next year.